Dukey goes to Brazil and brings the funk with him, creating a new fusion of sounds. Kronomyth 16.0: O nascimento do funk. It seems that every American jazz musician explores the music of Africa and Brazil at some point or another. 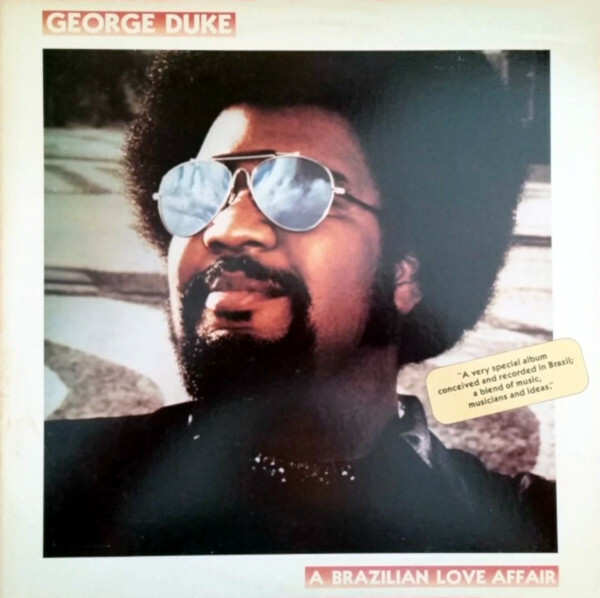 George Duke had already shown in interest in Brazilian music, recording Milton Nascimento’s famous “Maria Tres Filhos” as far back as 1974 (on Faces In Reflection). But A Brazilian Love Affair is something very different: a fusion of American jazz/funk and Brazilian jazz/pop that consummates Duke’s love affair with the country and its music. Duke alludes in the album notes to finally having the “means” (i.e., the money) to make this record, and we can infer from his reference to this as a “labor of love” that he didn’t expect to get his money back. The album didn’t chart particularly well in the US, at least not as well as his earlier funk albums, although listeners certainly got their money’s worth. Duke doesn’t simply appropriate Brazilian pop for his own funky designs but seeks to find middle ground between the two. That said, Duke can’t seem to resist adding a couple of radio-friendly funk numbers into the mix just to hedge his bets. The opening “Brazilian Love Affair” is such a commercial cushion. Selected as the album’s single, it is essentially Duke’s funk band augmented with Brazilian percussion (courtesy of Airto Moreira). You get a feel for the Brazilian currents to come, but you also get a funky bass solo from Byron Miller and a familiar Rhodes solo from Duke on the fade. “Summer Breezin’” is where the album hits its stride, blending Brazilian and American funk/disco music into something unique and wonderful. Lynn Davis and Josie James do a great job on the backing vocals (it’s a shame they weren’t used more on these sessions) and the whole piece blows by like a cool breeze. Duke also slips a terrific trombone solo into the arrangement, courtesy of Bill Reichenbach. “Cravo e Canela” is the first of two Milton Nascimento songs that feature the artist himself on vocals and guitar, and this leans much closer to traditional Brazilian music. Duke’s contribution to this and the closing Nascimento track, “Ao Que Vai Nascer” (which would roughly translate as “To those yet born”), are minimal. I suspect Duke’s light hand comes from the fact that you can’t improve upon perfection. As much as this is Duke’s project, Nascimento is the star of this album. (He was, of course, already an established star in Brazil.) The haunting “Ao Que Vai Nascer” will remain with the listener long after the album is over. After a short piano piece that was apparently composed one morning during the sessions, Duke is joined by Flora Purim and an all-Brazilian band for the delightful “Brazilian Sugar.” This and “Summer Breezin’” are probably the best representatives of the fusion that Duke was after, although “Up From The Sea It Arose And Ate Rio In One Swift Bite” gets an honorable mention for working a fiery electric guitar solo from Roland Bautista into the mix. “Sugar Loaf Mountain” and “Love Reborn,” on the other hand, fit more into the “inspired by Brazil” category. They feature Duke’s funk band and wouldn’t be completely unexpected on a typical George Duke record from this period, except for perhaps the wordless vocal style adopted by Duke on “Love Reborn.” When the band is joined by another Brazilian singer, Simone, on “I Need You Now,” the balance shifts back to the middle. Personally, I wasn’t that jazzed about hearing yet another funky followup to Reach For It, so the decision to take a southern detour and experiment with Brazilian sounds is a welcome departure. (I also love Brazil and its music, and not least because half of my family is Brazilian.) Whether it changes the way you hear George Duke, the answer is “probably not,” although it should expand your musical horizons a bit and get you running to buy at least one Milton Nascimento record. All songs written by George Duke unless noted. George Duke (vocals, rhodes, oberheim polyphonic synthesizer, strings, prophet v synthesizer, yamaha cp-70 electric grand piano, arp odyssey, minimoog, rhodes electric grand, crumar strong ensemble, yamaha acoustic grand piano, orchestra bells, vibes), Chico Batera (percussion), Roland Bautista (electric guitar), Byron Miller (bass) with Murrey Adler (string contractor on B5), Airto (percussion, shaker, tambourine, surdo on A1/B3/B5), Lynn Davis (vocal on A2/B4), Raul De Souza (trombone on A5), Sheila Escovedo (timbales, water chimes, glass chimes, cowbell, bongos, caxixi, finger chimes on B1/B2/B4), Flavio Faria (vocals on A3/B3), Jerry Hey (flugelhorn on A2/B4, trumpet on B1), Toninho Horta (acoustic guitar on A2/A5, electric guitar on A3/B5), Josie James (vocal on A2/B4), Jamil Joanes (bass on A3/A5/B4), Ricky Lawson (drums on A1/B1/B2/B4), Lucinha Lins (vocals on A3/B3), Milton Nascimento (vocals & acoustic guitar on A3/B5), Flora Purim (vocal on A5), William Reichenbach (trombone on A2/B1), Roberto Silva (drums, caxixi, agogo, talking drums, apito, tambourine on A2/A3/B2/B4), Simone (first lead vocal on B4), Lúcia Turnbull (vocals on A3), Larry Williams (tenor sax on A2, alto sax on B1), Zéluiz (vocals on A3/B3). Produced by George Duke; engineered by Kerry McNabb except A1 by Tommy Vicari. Released on elpee in May 1980 in the US (Epic, FE 36483) and the UK (Epic, S EPC 84311) with lyrics innersleeve; reached #119 on the US charts, #40 on the US R&B charts and #33 on the UK charts. Re-issued on elpee in 1983 in the UK (Epic, EPC 32348). Re-released on expanded, remastered compact disc and cassette on May 2, 1994 in the US (Columbia Jazz, ET 53032) with one bonus track (CD only). Re-issued on expanded compact disc on July 2, 2003 in Japan (Epic, EICP-7090) with one bonus track. Re-released on expanded compact disc on May 25, 2016 in Japan (Epic, SICJ-186) with 2 bonus tracks.